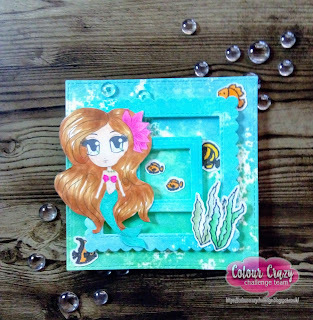 This mermaid was too cute to not join in this week over at THE COLOUR CRAZY CHALLENGE! The new challenge over on THE COLOUR CRAZY CHALLENGE is ‘Anything Goes’! There is a wonderful prize on offer from our sponsor, Moon Flower Digi Stamps so head across to the THE BLOG for details. For my card I have used the image Gigi Little Mermaid by Moon Flower Digi Stamps. I coloured the image in with Copic markers.